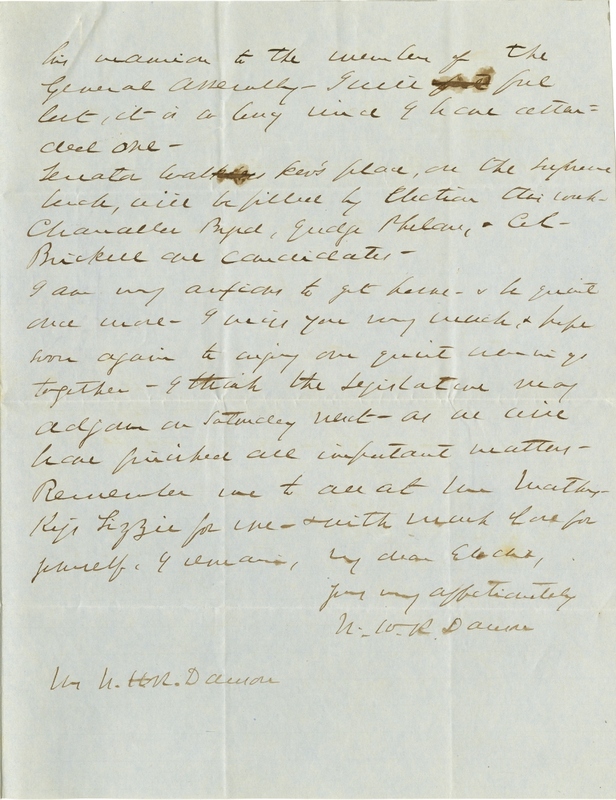 Item Description: Letter, dated 29 November, 1863 from Nathaniel Henry Rhodes Dawson to his wife Elodie Todd Dawson (sister of Mary Todd Lincoln) from Montgomery, Alabama. 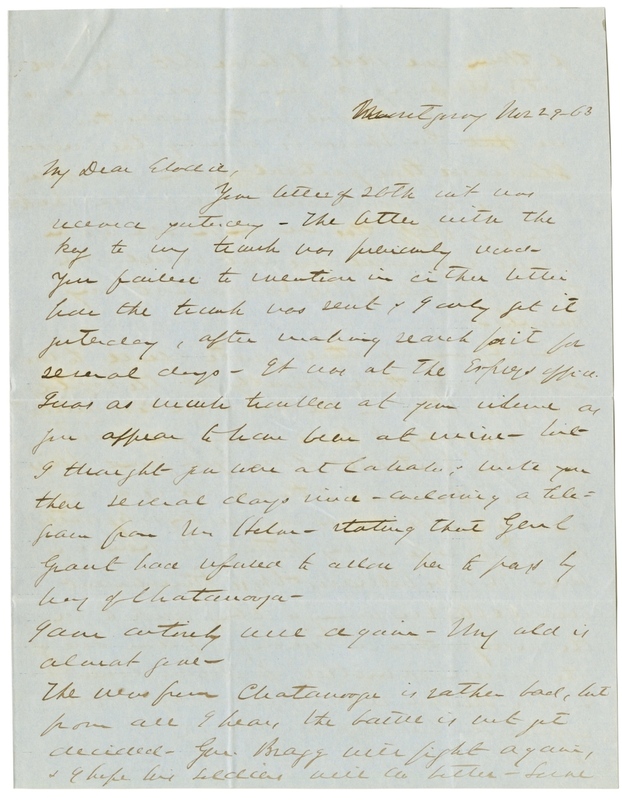 The letter describes Dawson’s time as legislature and rumors about the campaign in Chattanooga. Dawson was a Confederate officer in the 4th Alabama Infantry Regiment during the war as well as a legislature for Alabama from 1863-1865. Dawson survived the war and lived until 1895. Item Citation: Folder 39, N. H. R. Dawson Papers #00210, Southern Historical Collection, Wilson Library, University of North Carolina at Chapel Hill. Your letter of 26th ? was received yesterday. The letter with the key to my trunk was previously read. You failed to mention in either letter how the trunk was sent and I only got it yesterday, after making search for it for several days. It was at the Express office. I was as much troubled at your silence as you appear to have been at mine, but I thought you were at Cahaba?, and wrote you there several days since, enclosing a telegram from Mrs. 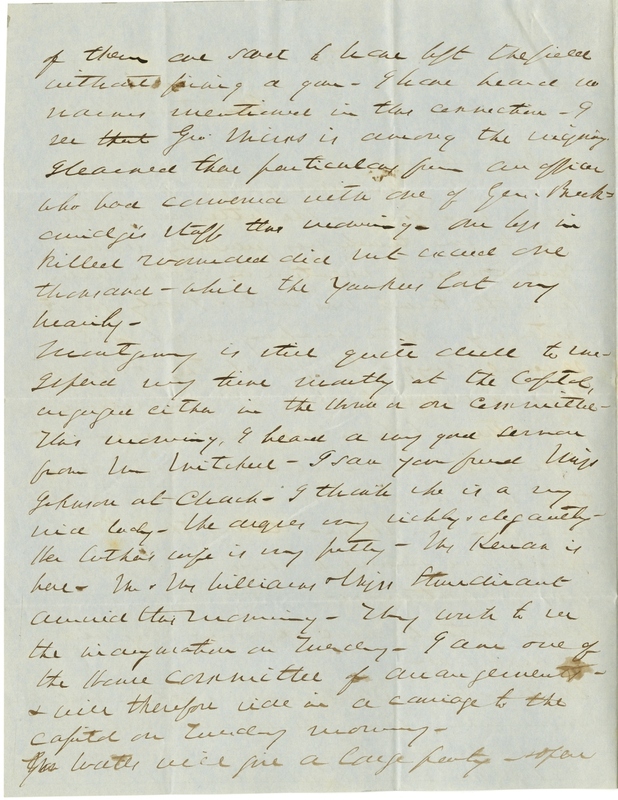 Helm, stating that Genl Grant had refused to allow her to pass by way of Chattanooga. I am entirely well again. My cold is almost gone. The news from Chatanooga is rather bad, but from all I hear the battle is not yet decided. Gen. Bragg will fight again, and I hope his soldiers will do better. Some of them are said to have left the field without firing a gun. I have heard no names mentioned in this connection. I see that Geo Mims is among the injury. I learned these particulars from an officer who had conversed with one of Gen. Breckenridge’s staff this morning. Our loss in killed and wounded did not exceed one thousand, while the Yankees lost very heavily. Montgomery is still dull to me. I spend my time mostly at the Capitol, engaged either in the House or on Committee. This morning, I heard a very good sermon from Mr. Mitchell. I saw your friend Miss Johnston at Church. I think she is a very nice lady. She dresses very richly and elegantly. Her brother’s wife is very pretty. Mrs Kenen is here. Mr and Mrs Williams and Miss Sturdivant arrived this morning. They wish to see the House Committee of arrangements, and will therefore ride in a carriage to the capitol on Tuesday morning. Mr Watts will give a large party, and open mansion to the members of the General Assembly. I will feel lost, it is so long since I have attended one. Senator Walker’s place on the supreme bench, will be filled by election this week. Chancellor Byrd, Judge Philan, and Col. Brickell are candidates. This entry was posted in Southern Historical Collection and tagged Chattanooga (T.N. ), General Bragg, General Ulysses S. Grant, Montgomery, Nathaniel Henry Rhodes Dawson. Bookmark the permalink.